On March 11, 2018, I had what we can call my first Cardiac Event. Specifically, around 9am, while opening shutters to look out the kitchen window, I suddenly needed, then received, my first automatic shock from the little defibrillator that lives in my chest. About 2 ½ years earlier, I had been diagnosed with severe dilated cardiomyopathy, a fancy name for a certain type of heart failure. My left ventricle had been underperforming, pumping less blood than it should be. When that happens, the left ventricle begins to realize it’s weakened and underperforming, and it tries to compensate by growing larger and thicker. Which makes it perform worse. Which makes it grow larger and thicker. Which makes it perform worse. You see where this becomes an issue. By the time we caught it, this had been going on for perhaps 2 years, perhaps longer – it’s hard to tell. The cause may be a virus, may be hereditary, may be neither – it’s hard to tell. The answers to Why and For How Long have never really been important to me – I have it, that’s pretty much the part that matters. Since my diagnosis, I’ve been on medications to lighten the load on my heart, and in December of 2015 I was implanted with an Automated Implantable Cardioverter/Defibrillator (AICD). It has faithfully resided near my left collarbone ever since, monitoring and tracking my heart’s behavior and keeping stats, uploading data to be analyzed by the team at my cardiac rhythm specialist’s office, waiting for a time when my heart rate would drop extremely low or rise extremely high, when it would kick in with a jolt to reset my heart’s rhythm. I’m typing this because that’s exactly what happened on March 11. I stepped to the window to open the shutters, felt my heart suddenly start racing, felt a little lightheaded, felt VERY lightheaded, and had time to briefly think I might be about to lose my balance or pass out. The next thing I remember is waking up in a pile on the floor. Gloria was standing nearby when it happened, including the part where I apparently reacted verbally to the shock, with an “oh!” that I don’t remember. She saw me go to the floor in medium-slow motion, first slowly leaning back onto a cabinet and slowly lowering toward the wall beside, until I just dropped the last few feet. My eyes were open the whole time, but I wasn’t consciously experiencing any of it. I woke up quickly after hitting the floor. Gloria called 911, and within about 2 minutes the EMTs were in the house checking me out. We told them what we each saw and experienced, and our theory that I’d perhaps gotten a defibrillation. My chest didn’t hurt, which I’d expected, and I never felt the shock, but the circumstantial evidence seemed pretty conclusive. My blood pressure was pretty high (for me) when they first checked it, and I was sweating buckets, but both soon started to ease up. After a quick EKG, I changed into “leaving the house” pants and walked, with help, to the ambulance. Within 30 minutes of opening the shutters, I was in my own room at the ER. 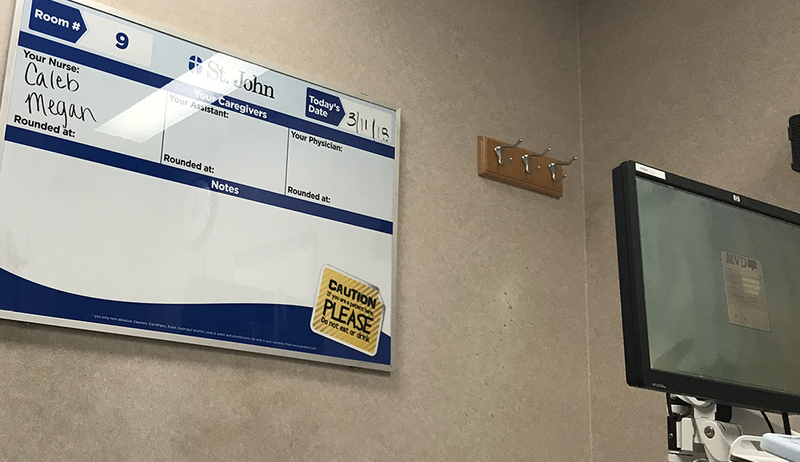 The ER tag teams – I saw no less than 10 different nurses, doctors and specialists – did lots of tests and blood work, another EKG, an x-ray, and a technician came in to interrogate my defibrillator. Sure enough, just before the defibrillator zapped me, my heart rate – normally around 75ish bpm – spiked up to 261. The defibrillator noticed, and administered a shock to reset it, and it started beating normally again. In other words, The Little Defibrillator That Lives in My Chest did exactly what it’s supposed to do. I mentioned to the technician that, a couple of times in the last 6 months or so, I’d felt a very brief similar heart-racing feeling, so brief I didn’t think anything of it at the time. He looked at the data and was quickly able to tell me the exact dates – one in October, one in December – right there in the readout. The Little Defibrillator That Lives in My Chest has a good memory. I spent about 4 hours in the ER, returned home by dinnertime, and took a few days off work. The ER doctor added a new medication to my daily routine, one that’s supposed to help keep my heart from getting into that state again. A few days later, I had an in-person checkup at my cardiac rhythm specialist’s office, and a few days later got my new ‘restrictions’ list: no driving for 6 months (rideshare companies, prepare to love me), and no air travel for 2 months. Because I asked about air travel, they were careful to clarify that I will never be permitted to fly a plane myself. As I type, it’s been almost 2 weeks since that Sunday morning, and I’m feeling good. Although it did take a couple days until I was comfortable opening those particular shutters again. My energy for the day-to-day stuff is back, I’ve been cleared to return to the gym (which I needed to do anyway), and the only real side effect of the new medicine is very dry hands. Gloria introduced me to First Aid Beauty brand Ultra Repair Cream, available from your local Sephora, which turns out to be wonderful for that. As we may have previously discussed, I’ve been working on a one-man “talking and singing” show & album about these cardiac adventures of mine. It’s a song or two away from having all of its music written, leaving the visuals and some storytelling bits left to finish. The show is coming together, and I’m hoping that by the end of 2018, it will be ready for public consumption. This month that show gained some new material. More importantly, it did not gain an ending. This Machine Kills Fashion: Either Tulsa's funniest musician or its most musical comedian, Acoustic Ross has written & performed original AntiFolk & comedy music for 20+ years. He has released 5 albums, served (since 2010) as house musician/jester in The Crispy Family Carnival, & played nearly 400 shows in venues of all sizes, ranging from Cain's Ballroom to a school bus. My Heart May Or May Not Go On.